It is a cold January morning and Shetland lies buried beneath a deep layer of snow. 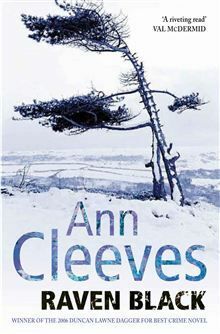 Trudging home, Fran Hunter's eye is drawn to a vivid splash of colour on the white ground, ravens circling above. It is the strangled body of her teenage neighbour Catherine Ross. As Fran opens her mouth to scream, the ravens continue their deadly dance ...The locals on the quiet island stubbornly focus their gaze on one man -- loner and simpleton Magnus Tait. But when police insist on opening out the investigation a veil of suspicion and fear is thrown over the entire community. For the first time in years, Catherine's neighbours nervously lock their doors, whilst a killer lives on in their midst.